Saipan Writer: A Useful Discovery! Okay, in Saipan and the tropics in general not everyone wants warm or hot water, but some of us do like a hot shower. And lots of people like to drink beer. So now there is a way to get these people together! 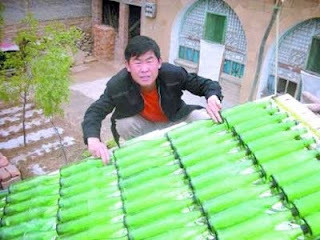 The beer-bottle-solar-water-heater. It's all about re-using and recycling! Eco-friendly. What's not to love about this? That is interesting, to bad that there was not a sketch for the connection to the bottles. This "hot water" would have to be run through a mixer valve (hot/cold water valve) though as it would be very hot by itself. That's very true. I had a solar water heater on my roof in Kagman, and the mixer valve got messed up. Boiling water! Perhaps it's cooler in China? You also have to be real careful about pressure and it seems those bottles would blow up pretty easily. Has the Spoils System Spoiled the CNMI? Angleo Endoreses Heinz for Governor. Voting on Initiatives--one by one-#3. Voting on the Initiatives--one by one-#1.